Jackie Ronne (October 13, 1919 – June 14, 2009) was an American explorer of Antarctica and the first woman in the world to be a working member of an Antarctic expedition (1947-8). She is also the namesake of the Ronne Ice Shelf. Born Edith Ann Maslin on October 13, 1919 in Baltimore, Maryland, Ronne spent her first two years in college at the College of Wooster in Wooster, Ohio and received a degree in history from George Washington University. After college she worked in the U.S. State Department where she spent five years serving in several different positions from file clerk to International Information Specialist in the Near and Far Eastern Division of Cultural Affairs. She married Finn Ronne on March 18, 1941, and on the expedition of 1946–1948 that her husband commanded, she became the first American woman to set foot on the Antarctic continent. She and Jennie Darlington, the wife of the expedition's chief pilot, became the first women to overwinter in Antarctica. 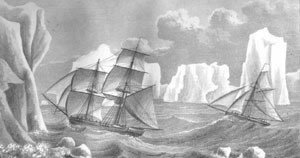 They spent 15 months together with 21 other members of the expedition in a small station they had set up on Stonington Island in Marguerite Bay. As the expedition's recorder & historian, Ronne wrote the news releases for the North American Newspaper Alliance. She also kept a daily history of the expedition's accomplishments, which formed the basis for her husband's book, Antarctic Conquest, published by Putnam in 1949, as well as making routine tidal and seismographic observations. Edith Ronne returned fifteen times to Antarctica, including a Navy-sponsored flight to the South Pole in 1971 to commemorate the 60th anniversary of Roald Amundsen first reaching the South Pole, and a 1995 trip back to her former base at Stonington Island as guest lecturer on the expedition cruise ship Explorer. She was a fellow of The Explorers Club and served as president of the Society of Woman Geographers from 1978–1981. She died on June 14, 2009, aged 89, from Alzheimer's disease. Edith Ronne Land was named after her by her husband, who mapped the last unknown coastline on earth. When the territory was determined to be mostly ice shelf, the name was changed to Edith Ronne Ice Shelf. At her request, the U.S. Board on Geographic Names removed her first name, so that the Ronne Ice Shelf would correspond to the continent's other large ice shelf, the Ross Ice Shelf and to commemorate all three Ronne explorers including her father-in-law, Martin Rønne, a member of Amundsen's South Pole expedition. Ronne was the recipient of a special Achievement Award from Columbian College of George Washington University and dedicated a Polar Section to the National Naval Museum. ^ a b c Sullivan, Patricia (June 23, 2009). "Edith 'Jackie' Ronne dies at 89; first U.S. woman on Antarctica". Los Angeles Times. Archived from the original on November 2, 2012. Retrieved July 4, 2009. Edith "Jackie" Ronne, 89, who became the first U.S. woman to set foot on Antarctica when she accompanied her explorer husband there in 1947, died June 14 of cancer and Alzheimer's disease at a Bethesda, Md., nursing home. She was 89. ^ a b Sullivan, Patricia (June 18, 2009). "Obituary: Edith 'Jackie' Ronne, First U.S. Woman on Antarctica". The Washington Post. ISSN 0190-8286. Retrieved August 27, 2016. ^ a b c d "Jackie Ronne". www.ronneantarcticexplorers.com. Retrieved May 30, 2016. ^ Sullivan, Walter S. (April 14, 1948). "Leader's Wife Undaunted by Antarctic Rigors -- Wilkins Greets Ship on Arrival". New York Times. Archived from the original on October 21, 2012. Retrieved July 4, 2009. New York harbor gave a dismal welcome yesterday to nineteen men and one woman who, as the Ronne Antarctic Research Expedition, carried the American flag in recent months to previously unsighted regions at the bottom of the world. ^ "Post Mortem - From D.C. to Antarctica". Washington Post. South Ice was a British support base 560 kilometres (300 nmi) from the South Pole at 82°05'S, 30°00'W in Edith Ronne Land, Antarctica during the International Geophysical Year, established by Commonwealth Trans-Antarctic Expedition, where three men overwintered during the Antarctic winter of 1957. In the same winter, men overwintered for the first time at the South Pole. The Scott Glacier is a major glacier, 120 miles (190 km) long, that drains the East Antarctic Ice Sheet through the Queen Maud Mountains to the Ross Ice Shelf. The Scott Glacier is one of a series of major glaciers flowing across the Transantarctic Mountains, with the Amundsen Glacier to the west and the Leverett and Reedy glaciers to the east.